We extend the notion ofk-sets and (≤k)-sets (see , , and ) to arrangements of curves and surfaces. In the case of curves in the plane, we assume that each curve is simple and separates the plane. Ak-point is an intersection point of a pair of the curves which is covered by exactlyk interiors of (or half-planes bounded by) other curves; thek-set is the set of allk-points in such an arrangement, and the (≤k)-set is the union of allj-sets, forj≤k. Adapting the probabilistic analysis technique of Clarkson and Shor , we obtain bounds that relate the maximum size of the (≤k)-set to the maximum size of a 0-set of a sample of the curves. Using known bounds on the size of such 0-sets we obtain asympotically tight bounds for the maximum size of the (≤k)-set in the following special cases: (i) If each pair of curves intersect at most twice, the maximum size is Θ(nkα(nk)). (ii) If the curves are unbounded arcs and each pair of them intersect at most three times, then the maximum size is Θ(nkα(n/k)). (iii) If the curves arex-monotone arcs and each pair of them intersect in at most some fixed numbers of points, then the maximum size of the (≤k)-set is Θ(k2λ s (nk)), where λ s (m) is the maximum length of (m,s)-Davenport-Schinzel sequences. We also obtain generalizations of these results to certain classes of surfaces in three and higher dimensions. 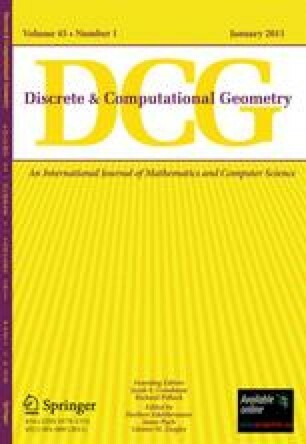 Finally, we present various applications of these results to arrangements of segments and curves, high-order Voronoi diagrams, partial stabbing of disjoint convex sets in the plane, and more. An interesting application yields andO(n logn) bound on the expected number of vertically visible features in an arrangement ofn horizontal discs when they are stacked on top of each other in random order. This in turn leads to an efficient randomized preprocessing ofn discs in the plane so as to allow fast stabbing queries, in which we want to report all discs containing a query point. Work on this paper has been supported by Office of Naval Research Grant N00014-87-K-0129, by National Science Foundation Grants DCR-83-20085 and CCR-89-01484, and by grants from the U.S.-Israeli Binational Science Foundation, the NCRD—the Israeli National Council for Research and Development-and the Fund for Basic Research in Electronics, Computers and Communication, administered by the Israeli Academy of Sciences.